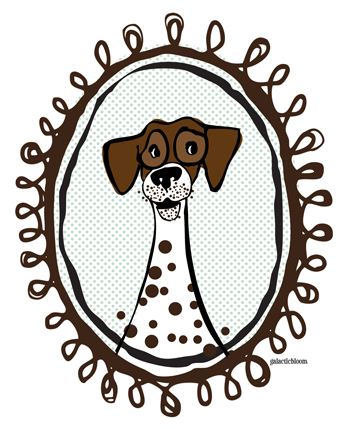 Winston is a German short-haired pointer, a.k.a. Brown-Spotted Doggie. If he reminds you of a certain speckled beastie in your life or if he just captures your fancy, you can purchase a variety of products with his lovable mug on them, including …well, mugs, and also iPhone cases, tshirts of all sizes, framed prints and more. Check him out in my Society 6 store. I’ll be adding a few more pups of various breeds over the coming weeks, and setting up my Etsy shop to accommodate custom pet portrait orders. Because #goals – I has them. Sometimes I get in a doodly mood, but can’t think of anything to draw. I’ve always thought illustrator Gemma Correll’s What I Wore Today project looked like fun, and with the hallowed advent of boot weather, it seemed like the perfect time to start a similar project of my own. 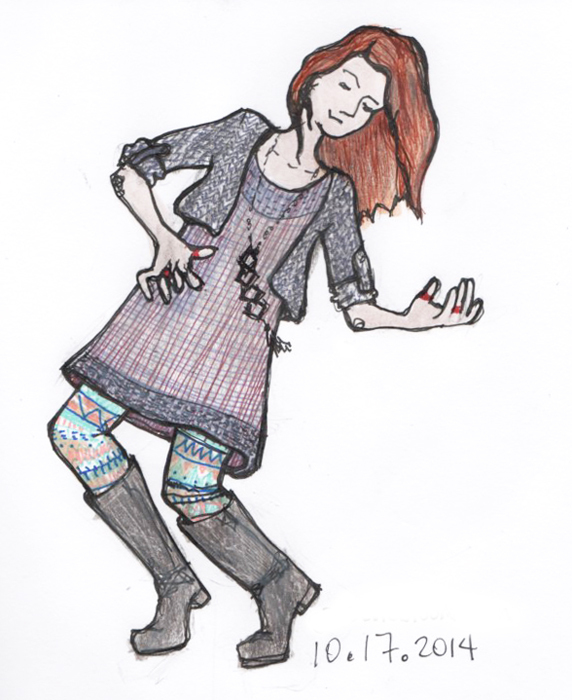 Besides, I really need to work on my people skills… as in how I might draw them n’ stuff. 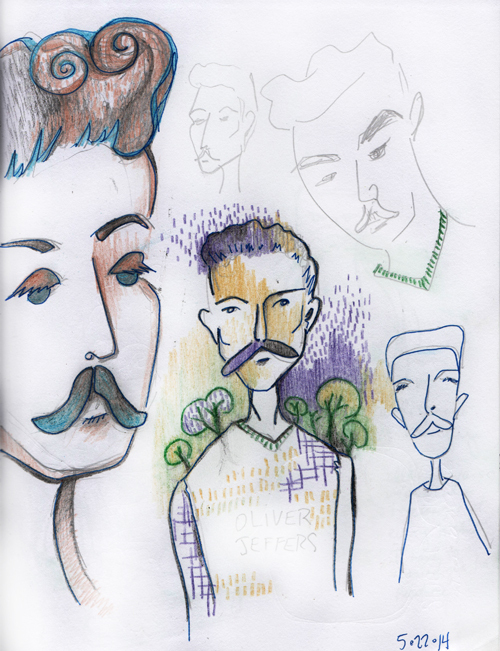 I tend to draw lots of animals and plants, architecture and such, but not humans very often. I also want to explore movement and action more, something a bit more dynamic than the ol’ flat and frontal. And somehow all that landed me here… playing the air guitar. I’m not sure where the idea came from, but it amuses me quite a bit. So far, I have four such renderings of the past week’s fashions, and in all of them, I am wailing away mid-solo on my imaginary Les Paul. This is my favorite. Rock on, y’all. 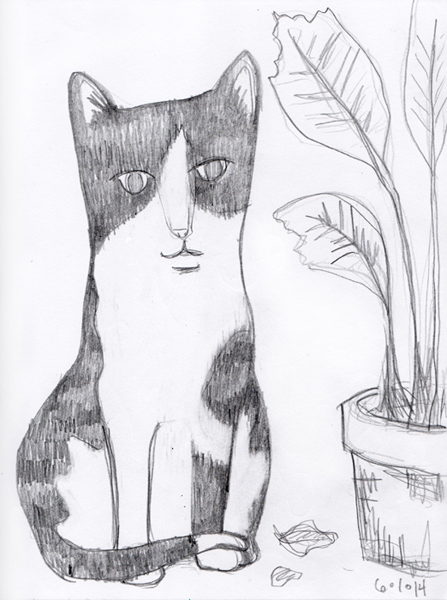 This is a fun little sketch of Jenkins, my little salad-eater. Jenkins turned a year-old this spring. Her hobbies include parkour, extreme napping, chasing feathered things, and sampling the potted flora. Her head is ironically large in this drawing. She’ll grow into it though. In other news, I spent all weekend on a 3-piece wedding invitation suite, which I’ll be test printing/proofing today and then posting here soon. It’s all hand-lettered and watercolored. Get excited. The perfect gift for any occasion: pet portraits! I started drawing dogs and cats last year as part of a children’s book project, and then sometime in the fall I began giving them as gifts to friends. First there were Joey’s cats in digital collage for his birthday, and then Joel’s cats in color pencil for Christmas. 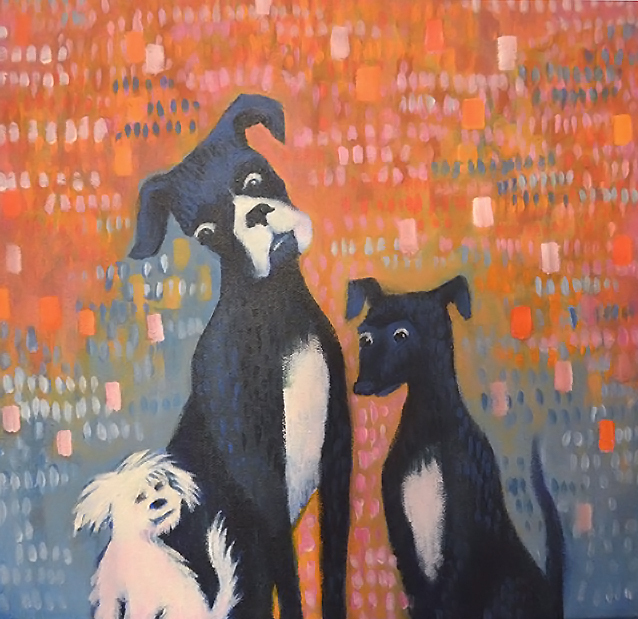 Adding to the repertoire, here’s Kelly & Tucker’s dogs in acrylic as a wedding gift. I think I enjoy the acrylic the best. Eventually I’m gonna get around to opening an Etsy account and start hawking pet portraits and stuff to people I don’t know. That’s on my list of goals for 2014. If you’d like to commission an affordable pet portrait for yourself or as a gift, tell me in the comments below and I’ll contact you about the details. As always, Thanks for stopping by! So far looks like 2014 is Year of the Cat– Because Cats! 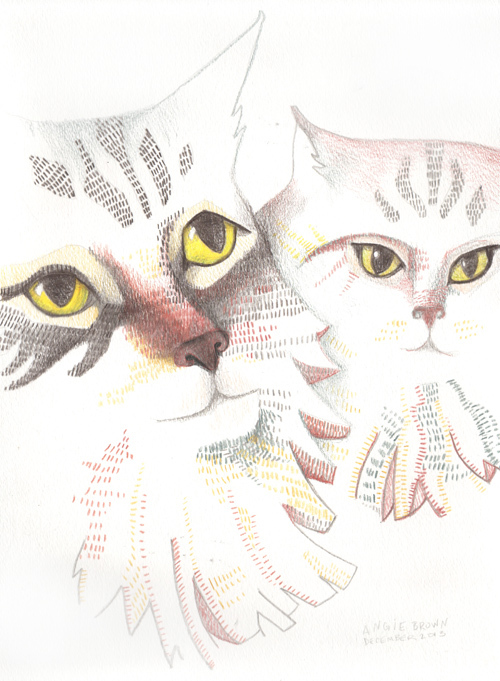 Above, for my BFF, Joel– a portrait of his cats in color pencil and framed up nice. I tried something new here with the stylized fur texture and negative space, and I do like the way it turned out. 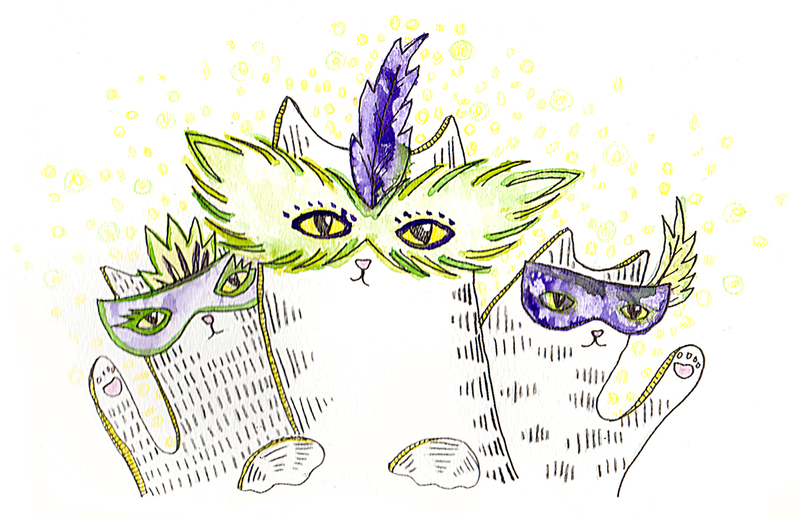 And then below, I drew these cats for the local feral rescue organization– they’re having a Mardi Gras-themed fundraiser next month. 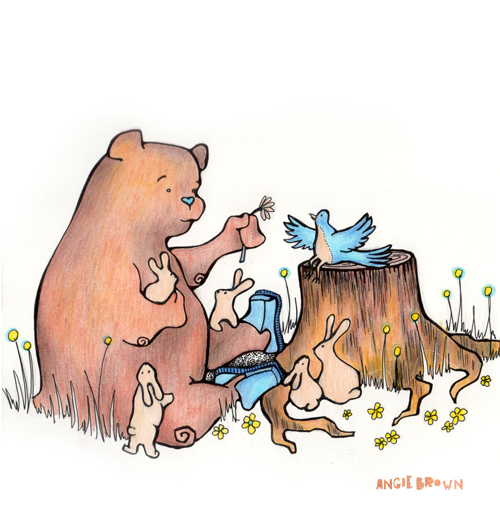 I’ve designed the poster using this drawing and will also be donating the original watercolor/ink to the silent auction. Otherwise, I have been working on a few other things that are not cats or cat-related. Because I do sometimes draw other stuff. Stay tuned! 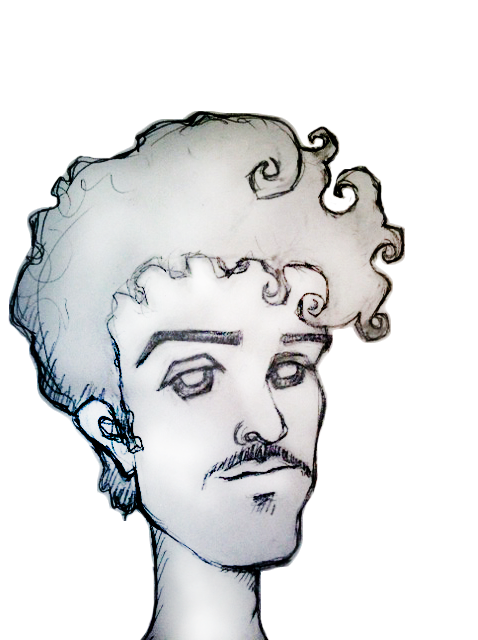 This here is Landon Marcus, musician, artist, performer, cosmic wanderer, and all-around Super Cool Dude. He is– like seriously– one of the ten people that would be allowed on my personal island, if I had one. In fact, I would have his residence built right across the courtyard from mine, and he could live there with his girlfriend (who happens to be my BFF) and as many cats as they wanted. So now I need to finish this project. It has to be really super cool. In the meantime, you should check out the music of Landon Marcus. And then come back and tell me if I have captured his Super Cool Dudeness.